Choose Command→System Preferences or click the System Preferences icon on the Dock or from Launchpad. The Notifications preferences window opens, as shown. Your preferences window may look slightly different based on the apps you have installed on your Mac. Do Not Disturb is its own section. 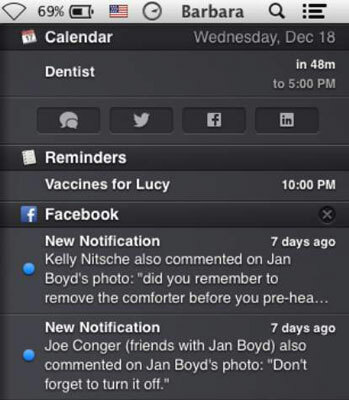 In Notification Center lists all the apps that you choose to appear in the Notification Center. Not In Notification Center lists apps you choose not to appear in the Notification Center. Words immediately under the app name indicate whether badges, banners, alerts, and/or sounds are used to notify you of information from the app. Manage how your Mac alerts you. In the list that runs down the left of the Notifications preferences window, click an app and choose how you want to be notified when that app has information for you. The figure shows the notification options for Calendar. Click the Calendar alert style you prefer. Choose None, Banners, or Alerts. Select the check boxes for the type of notifications you want. If you select Show in Notification Center, use the pop-up menu to choose how many recent notifications you want to see. If you deselect Show in Notification Center, the app will be moved to the Not in Notification Center section of the list on the left of the preferences window. Click the next app in the list and set your preferences. Twitter: Click the Notifications button of the Twitter alert preferences to choose to show notifications for Direct Messages and specify from whom you want to see mentions and replies. Mail and Messages: Choose if and when you want to see a message preview. Open the Sort Notification Center pop-up menu and choose to sort. (Optional) Click Share Buttons and then select the Show Share Buttons in Notification Center check box. This will let you write and send Messages and post to Facebook, Twitter, and Facebook directly from the Notification Center. (Optional) Click Do Not Disturb, as shown, to schedule an interruption-free work or rest time. Turn on Do Not Disturb: Select this check box and then use the arrows to set the From and To times to schedule a daily fixed time of silence. Deselect the checkbox to deactivate scheduled Do Not Disturb time. When Mirroring to TVs and Projectors: Selecting this check box prevents interruptions such as a banner that might come across the projection screen during your multi-million dollar deal presentation. Use Do Not Disturb to find some peace and quiet. When Do Not Disturb Is Turned On: Select the check boxes for the types of FaceTime calls you want to allow when Do Not Disturb is turned on. Choose Everyone or Favorites if you want to allow some or all FaceTime calls. Click Allow Repeated Calls if you want insistent callers to get through. 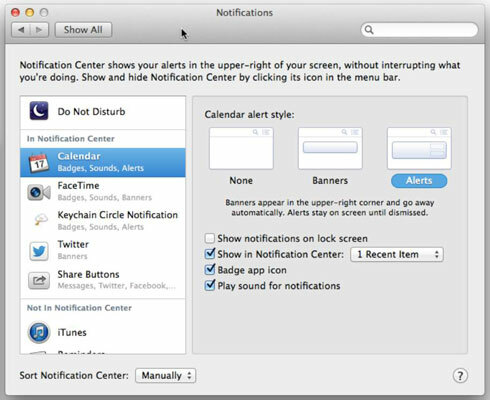 To see how your settings affect the Notification Center, click the Notification Center button, the right-most button of the menu bar. Its screen appears, as shown in the figure. Click the Share buttons at the top to write a Messages message or post to your Facebook, Twitter, or LinkedIn account. You see buttons only for accounts to which you signed in in Internet Account preferences. For Facebook or LinkedIn, open the pop-up menu to choose who you want to see your post. See notifications from different apps in one place. (Optional) Click the Notifications Preferences button at the bottom-right corner to open the Notifications Preferences window and make changes. 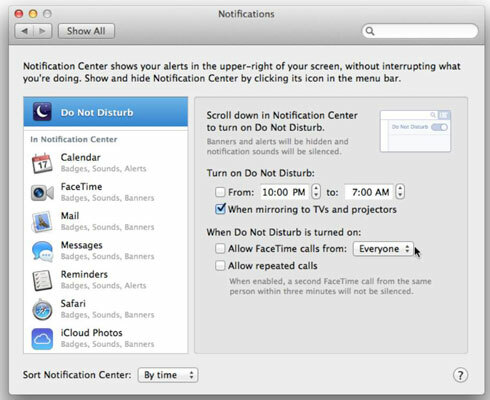 Click the Desktop to close Notification Center.